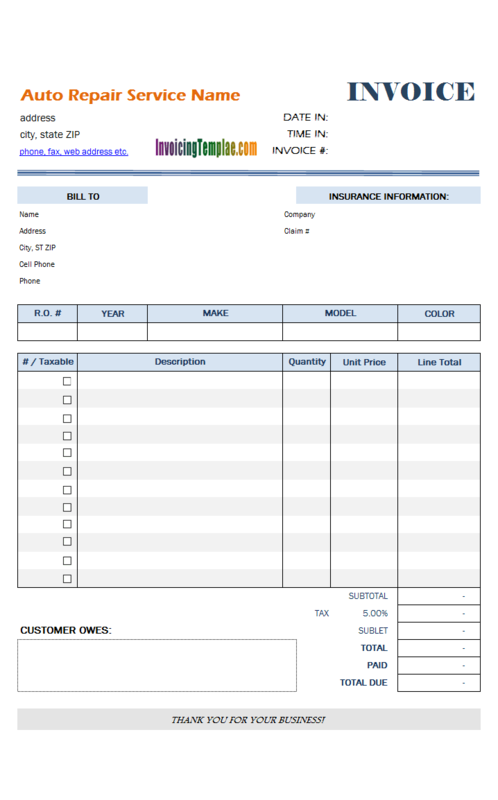 This professionally designed free auto repair invoice template is an Excel spreadsheet that includes fields for auto and vehicle repair shop. Unlike the other service invoice template, this design allows you to detail the car, automobile, motorcycle, or Recreational Vehicle (RV) that you are repairing. This free auto repair invoice format has Excel formulas assigned so the line totals, taxes and total amount due are calculated automatically. The cells that have Excel formulas assigned are not editable. By default this template shows only one tax. If you install the Invoice Manager program it is easy to modify the tax configuration. Each line on the detail section has a "Taxable" checkbox attached. This allows you to easily mark whether the item is taxable. Installing Invoice Manager turns this simple vehicle repair invoice template into a powerful auto repair invoice software that supports automatic invoice numbering, sending bills with email in PDF or image format, automatic backup, reporting, etc. By default the Excel sheet is protected. To remove the protection, go to Excel "Review" ribbon tab and choose "Unprotect sheet".